Kayak Facemasks- Why You Need One! This story is from the Foothills Paddling Club email list. It’s a great sales pitch for face protection on your helmet. OK folks, I’m going to “out myself” and my carnage story from the weekend in the spirit of “learn from watching others instead of doing it yourself”. 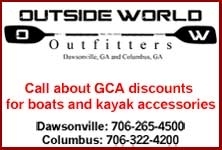 I was with the Chattooga 3.5 trip on Saturday, which was a wonderful day on the water all around. The people were great, the river was fun, the weather was good, etc. I was paddling my brand-new-to-me boat, and having a fun time getting used to it. Then, I provided some carnage. Here’s the story-We were at Woodall, sneaking to the right. I caught the eddy mid-river just before the rocky chute, let myself drift too close to the little hole adjacent to the eddy while looking over the line, caught my stern in the current, and flipped. (I was not accustomed to *having* a comparatively lengthy stern to catch, since paddling so much in the Star.) I set up to roll but before I could execute it, I’d already drifted into very shallow, very rocky water. As I was tucked forward, I went over the edge of the non-line rocky drop option near the sneak. (Can’t recommend this line, especially not upside down-probably not right side up either. It wasn’t smooth.) I encountered numerous rocks, got yanked all around, and ended up lying on the back deck between the boat and the rocks, unable to reach my grab-loop. It was a fairly awful position to be in, and I could feel the rocks hitting my chin bar and grinding off to the side…it was clearly the only thing keeping my face off the rocks. I also found rocks with both arms, shoulders, torso, back, etc. I had my progress abruptly halted at one point, and assumed I was pinned, but fortunately I momentarily popped free. By the end of the chute/drop, I’d let go of my paddle and took a swim in the eddy pool at the bottom. The remainder of our group did an awesome job with boat/paddle/me recovery. I was kind of disoriented, and one person in particular did a really nice job of assessing me and talking to me and making sure I got to shore. He made eye contact the moment I surfaced-must remember how reassuring that is! Clayton followed me down the rocky non-line chute upright and reports that it is not a good alternate line and that there is a piton rock at the bottom. Upon recovery assessment, I discovered that my spray skirt was ripped completely through around the front cockpit rim. I’d guess my ‘sudden stop’ sensation had to do with my cockpit rim catching on a rock. I was/am pretty battered from all the rocks, but my helmet really saved the day. I’d felt like wearing it regularly (vs for a ‘select few’ runs) was a good idea before, but it’s now proven itself and totally earned a permanent position in my personal gear set. One of the prominent thoughts in my head as I was grinding along, and still now, is “Thank God I have the full-face on”. I would probably be in a surgical recovery suite with a wired jaw and an unintentional makeover instead of just home and sore had I not been wearing it. Once back in the boat, the remainder of Woodall rapid went smoothly, even with the damaged skirt taking on water. Another concern people sometimes mention with the chin bars is the fear of them getting caught if you’re dragging along. Mine didn’t during this event, even though my cockpit apparently did. I tried to keep my chin tucked to protect my neck, but I doubt I really succeeded with it. Make of that what you will. Bottom line, I highly recommend the face-protection helmets. You can add face cages to most standard helmets-NOC can help with that. WRSI makes a chin bar that attaches to their standard helmet without modification. My full-face helmet is an FNA (due to my apparently huge head), Clayton’s is a Shred Ready (what I deemed the best option for a normal-sized head when I was researching all of this). New options are now available too-the Sweets one wasn’t out when I bought us ours 2 yrs ago. My big factors in deciding were field of vision, fit/comfort, coverage, and construction quality per price point. I’m glad that I’m mostly OK, but it does scare me a bit to think of how easily a friend could sustain that sort of accident and need the resulting medical care. It’s worth considering, particularly the next time you want to replace a helmet!